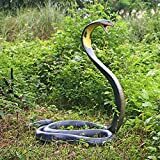 If you fear snakes, you might think twice before setting your drink down on this cool new Serpent Table from Blackman Cruz... and you better use a coaster! This frightful yet beautiful end table features a long coiled snake crafted from polished bronze rearing up to strike, but no worries, it can't bite you with the onyx disc tabletop in its mouth. 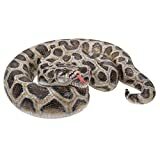 Limited to only 25 editions at $7500 apiece, so obviously pick up a few for all your snake loving friends while you still can. Sssssss!